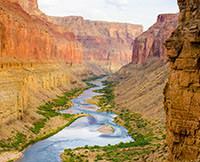 The DVD for the Grand Canyon Rafting Tour helped us know what to expect. My wife and I were on a June rafting trip with Western River Expeditions. The DVD they sent was very helpful to get a better idea of what the total experience would be like. The written information was very complete but seeing the DVD showing previous trips really helped. Our guides Steve Wiley and Amy Harmon were on our raft and they were really outstanding. Hard working, friendly, helpful, knowledgeable. We would travel with them anywhere, anytime!